Imagine a world in which commuters who live along the Forest Drive corridor could take the bus into Washington D.C. without ever having to get into their cars. Could it happen? Yes. Whether or not it does depends in part on whether there is enough interest to warrant a Forest Drive Commuter Shuttle. Traffic moves at a snail's pace on Forest Drive and Aris T. Allen Boulevard during the morning and evening commutes. 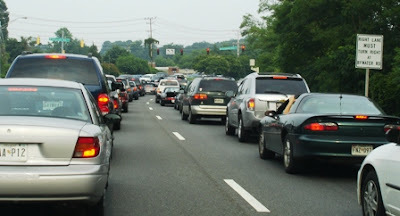 Commuters lament that it takes longer to drive from their houses to Route 50 every morning than it does to reach Washington D.C. once they're on Route 50. The Maryland Transit Administration runs two popular commuter bus routes from Annapolis to the New Carrollton Metro station (Route 921) and into D.C. (Route 922). These routes pick up and drop off passengers at the Navy Stadium, at a few stops along West Street and at the Harry S. Truman Park-and-Ride off Riva Road. It is a convenient service for people who live in town. The problem is that commuters who live along Forest Drive have to first get in their cars to reach the Park-and-Ride. And once someone drives down Forest Drive, it's usually easier to just keep driving into D.C. than to park and wait for the commuter bus. A possible remedy is a Forest Drive Commuter Shuttle. Its route would be a straight shot along Bay Ridge Road and Forest Drive to the Truman Park-and-Ride. It would stop at one or two intercept lots to pick up passengers. By offering commuters an alternative to battling Forest Drive traffic, it could encourage more bus ridership and take a few more cars off the road. Where would the intercept lots be? One could be at Peninsula Park on Bay Ridge Road. It is ideally located near a dozen neighborhoods from Arundel on the Bay to Annapolis Roads. It's so convenient that people could bike there instead of drive. If a suitable location were found, another lot could be farther up Forest Drive near Spa Road or Hilltop Lane. Would a Commuter Shuttle cure gridlock on Forest Drive? Of course not. But it would make a big difference for those who used the service. Imagine, leaving your house in the morning and taking the bus all the way into Washington D.C. without ever getting into your car. Right now this is just an idea. It is unclear if, when or how it might become a reality. The first step is to determine if there is enough interest to pursue this further. Please contact me with your input. I especially encourage feedback from people who live along the Forest Drive corridor and commute into D.C.